Without a doubt, blogging about living in Oaxaca has brought a myriad of fascinating, knowledgeable, and just plain fun people into my life. Thus, after meeting through my blog a couple of years ago, Kalisa Wells and I finally met in person last week at a textile talk at the Oaxaca Lending Library. 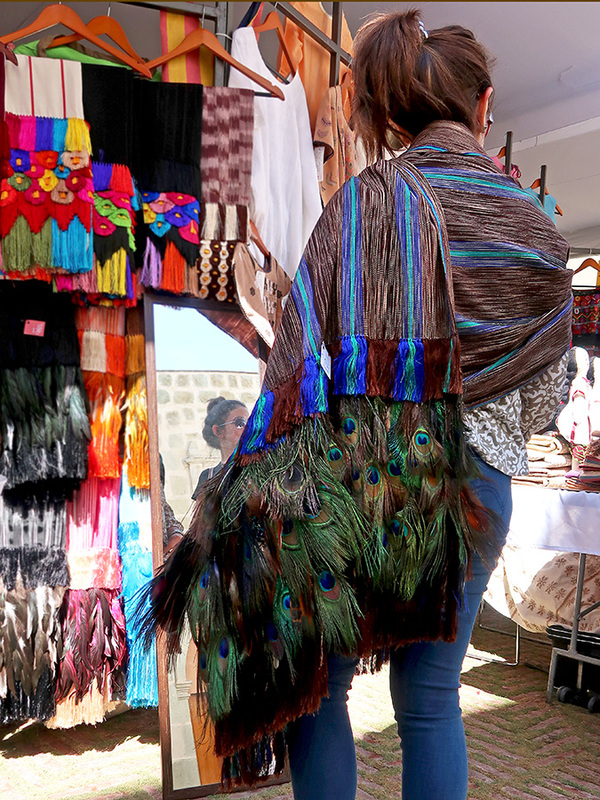 Given that we both love textiles, we arranged to rendezvous a couple of days later at a Museo Textil de Oaxaca expo-venta. While I was acquainted with the work of most of the artisans from Oaxaca on display, I was unfamiliar with the weaving of Ahuirán, Michoacán. Kalisa has a long history with traveling, living, and loving Mexico — including Michoacán. 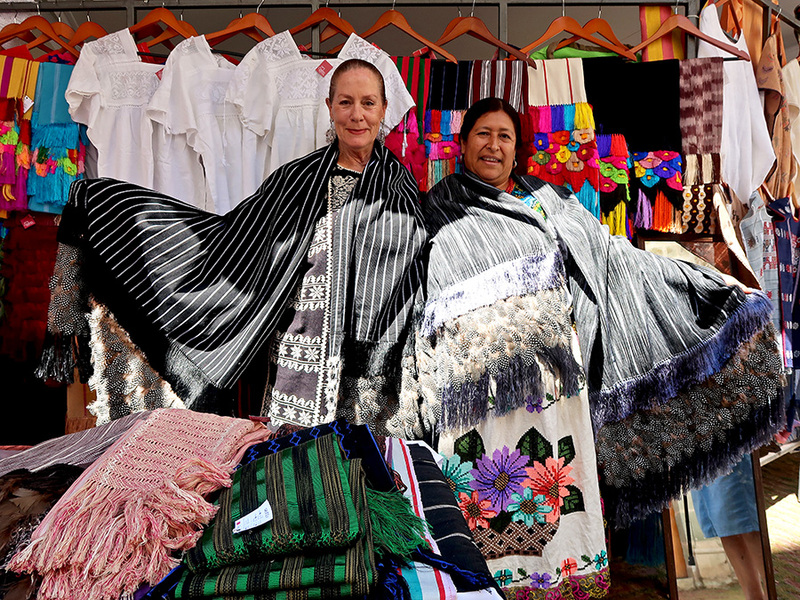 So, with great enthusiasm, she whisked me off to the booth of Purépecha weaver Cecelia Bautista Caballero and her daughters, Ángeles Rodriguez Bautista and Araceli Rodriguez Bautista — where Kalisa was greeted like a long lost sister and I was warmly welcomed. 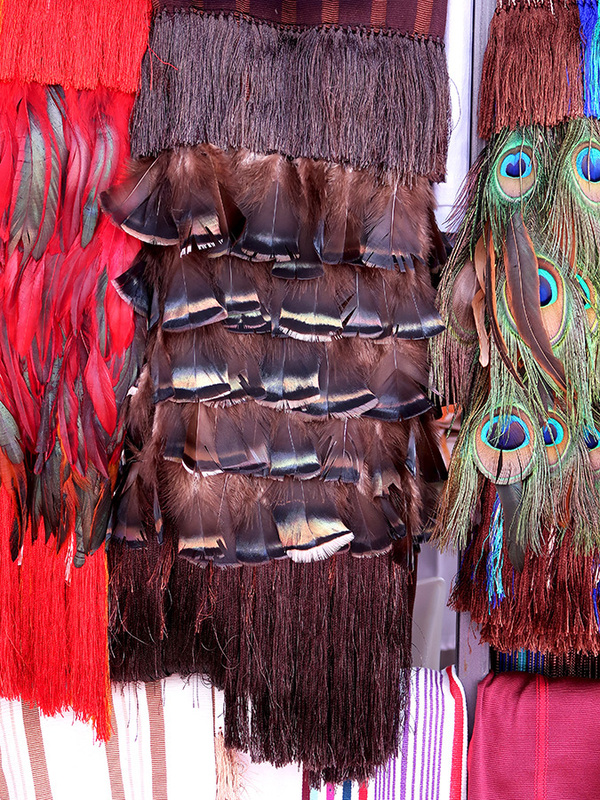 Among other innovations, Cecilia brought back the pre-Hispanic Purépecha tradition of using feathers in weaving. 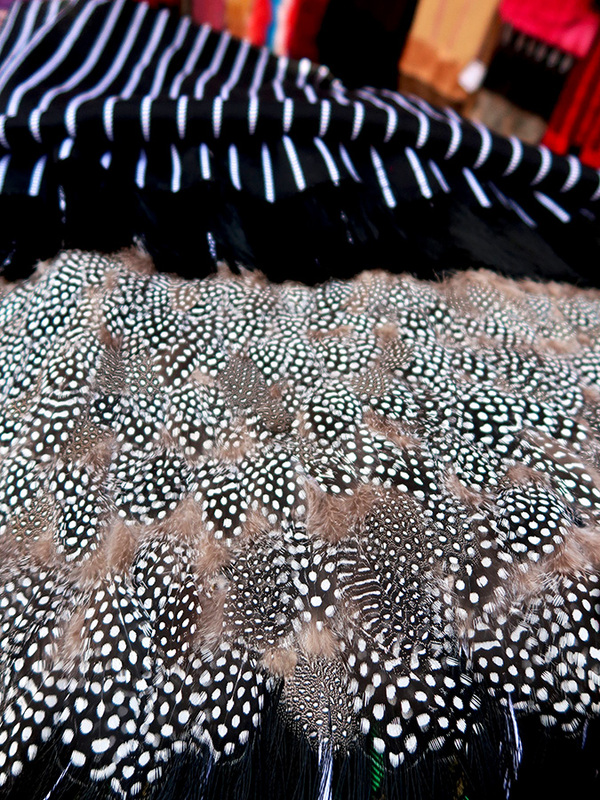 Multiple layers of individual feathers are hand sewn into the fringe of many of her beautiful backstrap woven rebozos (shawls) — providing an ethereal elegance to these staples of women’s attire in Mexico. One of the daughters soon had us draped in these works of art, where we drew a crowd — some of whom also couldn’t resist being wrapped in the beauty of these exquisite pieces. Meeting new people almost always leads to learning new things and experiencing culture in more personal ways.